Even though Adam Driver was director JJ Abrams' first choice to play Kylo Ren in Star Wars: The Force Awakens, the Star Wars producers cast a wide net to find the young actors who would become the new face of the galaxy far, far away, which led to some interesting auditions. 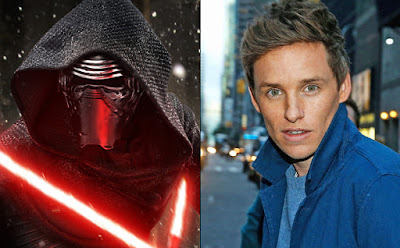 One actor who had an especially poor (yet hilarious) experience auditioning for the role of Kylo was The Theory of Everything star Eddie Redmayne. Redmayne, who is currently promoting his role in J.K. Rowling's Harry Potter spin off Fantastic Beasts and Where to Find Them, shared his audition story with Uproxx. "That was a really hilarious moment. Because it was Nina Gold, who I have to thank a lot because she’s cast me in several films. And she was just sitting there and I was trying again and again with different versions of my kind of ‘koohh paaaah’ [Darth Vader breathing sound] voice. And after like 10 shots she’s like, ‘You got anything else?’ I was like, ‘No.’"
I think we can all agree it's for that Adam Driver is best suited for Kylo Ren and Eddie Redmayne is best suited for Newt Scamander.